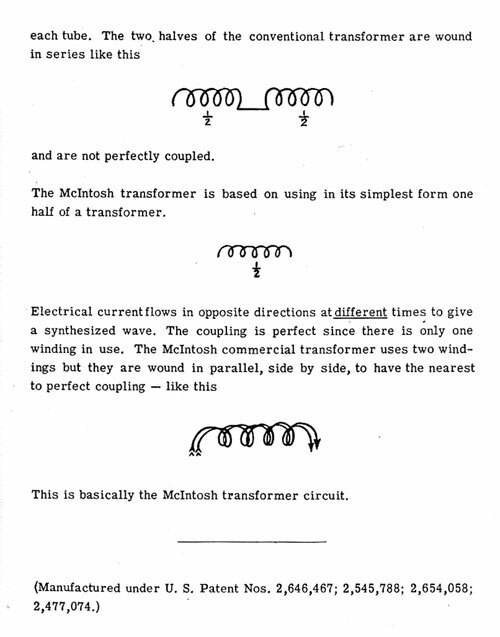 How did the term “Unity-Coupling” originate? 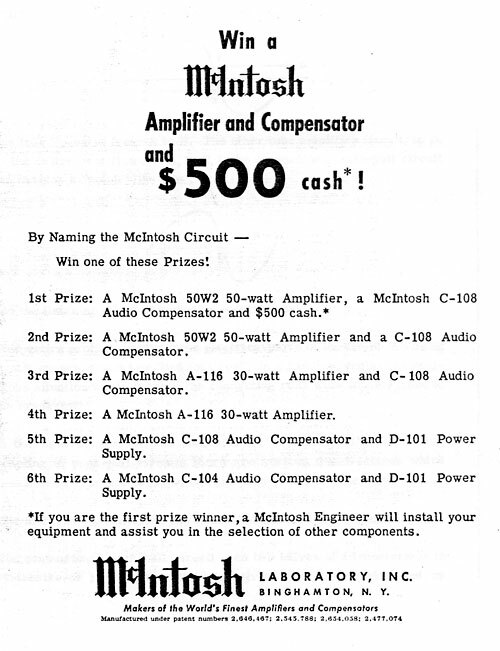 In the January-February 1954 issue of High Fidelity magazine, an advertisement described a “Name the McIntosh Circuit” contest and featured six big prizes. 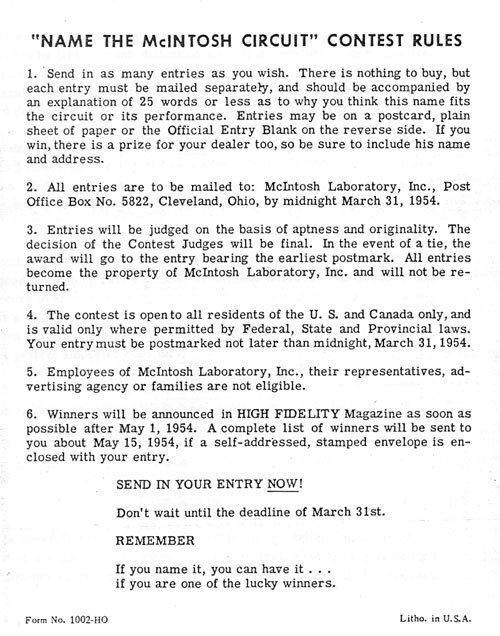 All entries had to be postmarked not later than midnight March 31, 1954. At that time, McIntosh was still located at 322 Water Street in Binghamton, NY. 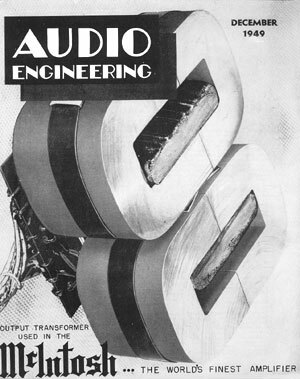 The above note was published in the Industry People section of the April 1954 issue of Audio magazine. No mention was made of any winners of the contest. 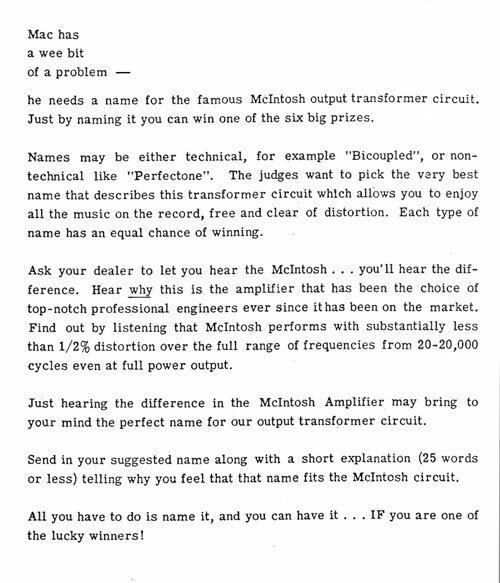 According to this note, the contest was to name the amplifier and not the circuit. However, that may have only been the interpretation of someone at the magazine. 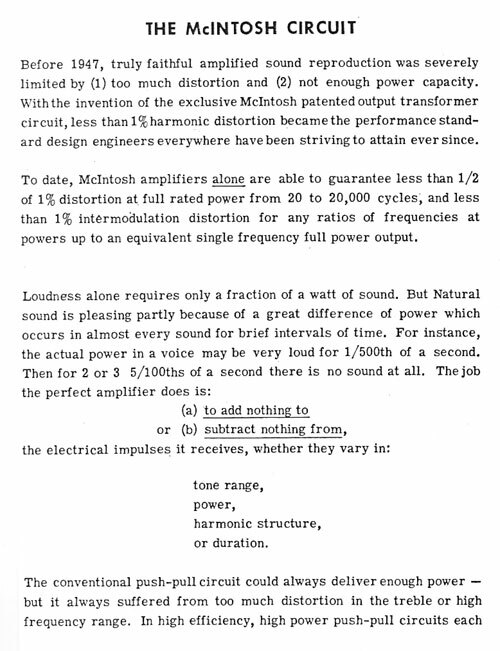 A paper titled “A New 30-Watt Power Amplifier” was presented at the Fifth Annual Convention of the Audio Engineering Society in New York, October 14-17, 1953. It was presented by Sidney A. Corderman and Frank H. McIntosh, McIntosh Laboratory, Binghamton, NY. 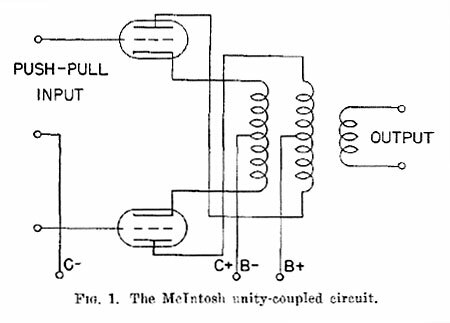 The term “Unity-Coupled Circuit” was used with the above diagram to describe the amplifier during the presentation. The term was also used frequently in other sections of the paper. 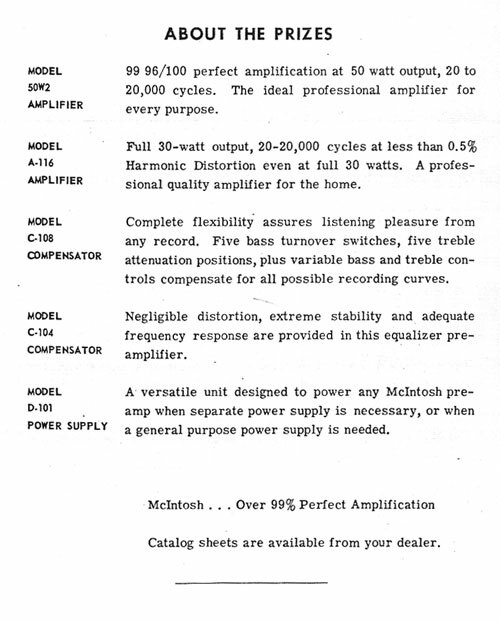 The date of this presentation is earlier than the January-February 1954 contest announced in High Fidelity magazine. 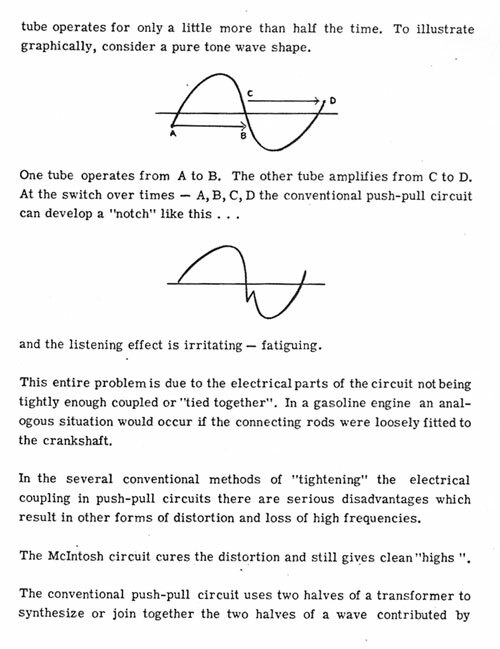 So if the circuit was already named and used thereafter, what was the point of the contest? Very few people are still living who might remember the contest and could explain the events. So far, I have not found any answers. 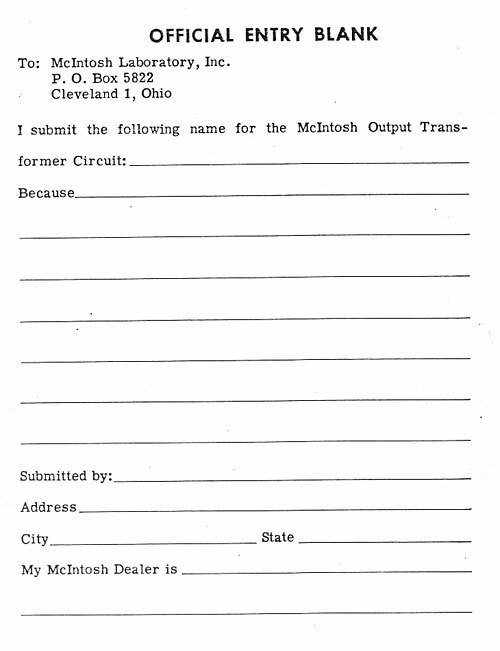 Here is a copy of the entry form.